After years of living with the same furniture I’ve had since college (! ), it’s finally time to decorate my house and have “a look”. As you can tell by my projects, I love the Americana/Primitive look (think Country Sampler magazine). To that end, I have been scouring the local thrift stores, flea markets, and garage sales for some furniture and knick knacks that can be used in decorating. It’s been about a week and I already have several “finds” I am rather proud of. 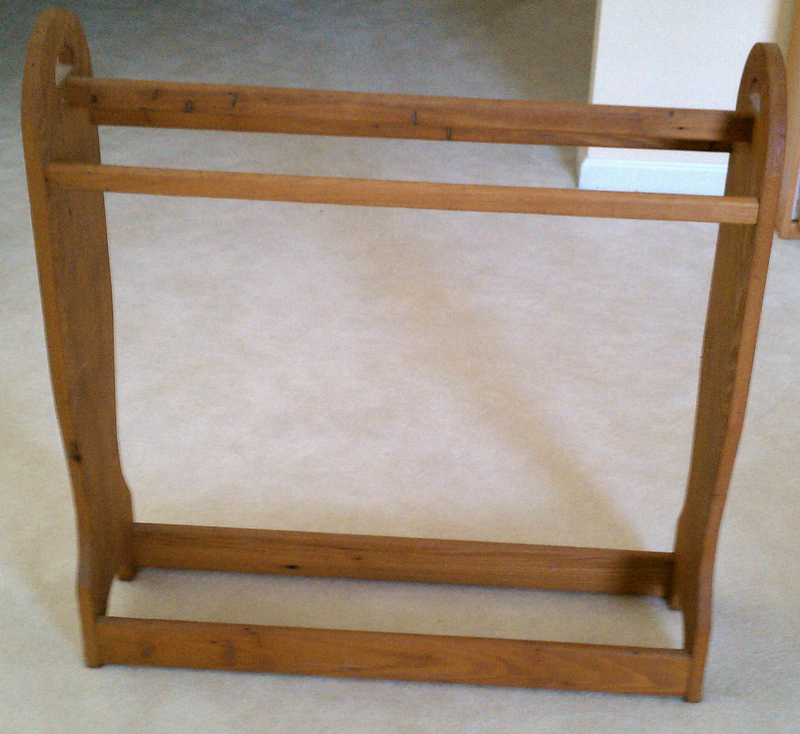 This is a very nice quilt rack. It just needs to be cleaned up a bit! This is a hand-crafted wooden bench. This needs to be cleaned and refinished. Shouldn’t be too hard for me to do (I hope). This is known as a telephone chair – probably from the 40’s or 50’s. I plan to strip off the paint, re-paint it, and re-cover the cushion. Any suggestions for colors? 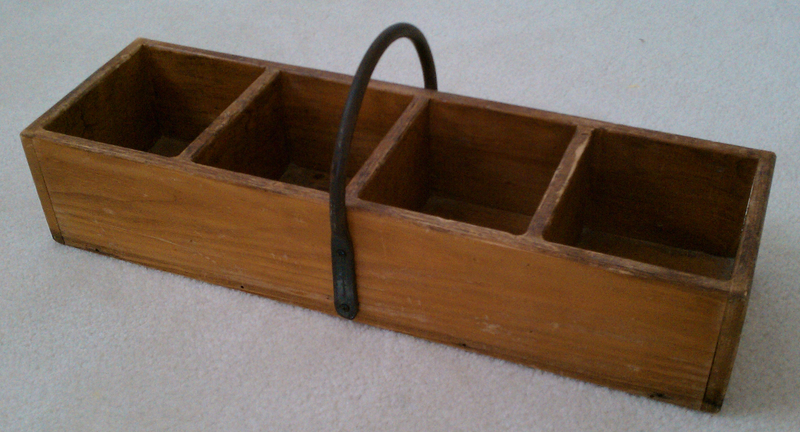 I just love this wooden carrier – not sure what it was used for, maybe tools? 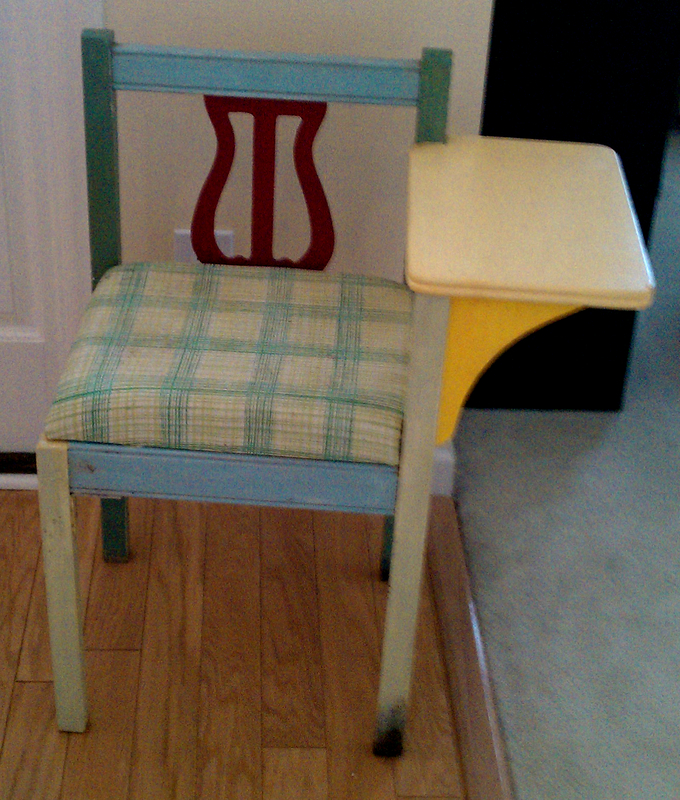 It’s in great condition, and I envision sitting by the fire and using this for my sewing projects. Lots of space to put wool, fabric, and other supplies! I like all the finds except the telephone chair. If that turns out to be a nice hard wood, I will chance my mind. It is hard to tell from the picture but it looks like it is just put together with trim. I think you have really found some nice things. If you keep the chair any of your color pallet of quilting material will look great. Thanks! The chair is made of pretty decent wood and I think it will look pretty good when I re-do the paint and cushion. I am new at your blog –Jennifer and I follow each others blog and I just left a comment on hers and noticed your comment, so I came to pay a little visit! I love your new finds. It’s always so much fun going to garage sales, SS Army and Auctions! You never know what new treasure you will find—large or small. I will visit you again, thanks for sharing–“congratulations” on your little quilt, it is darling! Thanks for visiting Carolyn! Glad you like my little quilt :). Auctions are a great suggestion – I need to find out where we have them here!